Weave Magazine: Submission Deadline: July 31st! You have four days left to submit your poetry, fiction, flash, nonfiction, reviews, drama, and artwork to Weave! This includes our poetry and flash fiction contests (check out the contest guidelines first). So send us your best by July 31st. We look forward to reading your work. 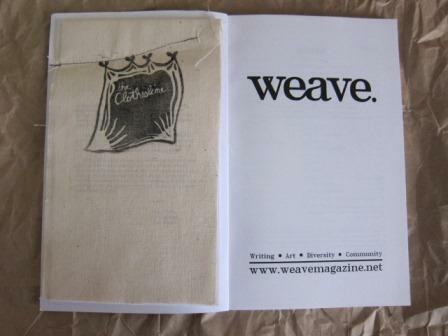 Weave Issue 06 was featured on the NewPages blog, showcasing our sewn insert, The Clothesline. "It is sewn onto the inside front cover, the line of the stitch follows the clothesline on the cover art. 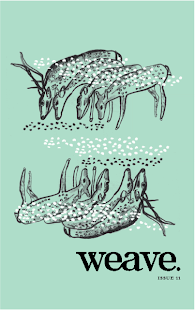 The insert features the works of Andrew Knock, Rebecca Dunham, Sarah Machinak, Jane McCafferty, and Mary O'Donnell, and is, in its own way, a celebration and appreciation of the in-your-hand print publication." We have received a lot of positive feedback on this issue and are so happy for our contributors. If you don't have a copy, get one. Then tell us what you think on Twitter so we can share it with our followers. Happy reading!